Today is the Solemnity of the Body and Blood of Christ (Corpus Christi) in the Catholic Church. I am reminded of something I got to experience a little over twenty years ago. When I was in college, I had the privilege of witnessing a Eucharistic miracle. The semester had just started and it was around the second week of September, in 1991. I was on my way to class and my roommate was passing me in the middle of campus as she was coming back from class. She asked me if I would like to go see a Eucharistic miracle. I said, "Sure!" She told me that she and a friend would pick me up when I got out of class. I really didn't know at that time what I was saying yes to, but I was always up for an adventure and I did not have anything else going on. Like she said, they picked me up right after class and there was one other girl that my roommate knew that was in the car as well. I thought we were going to go see a Eucharistic miracle that was on public display but as we were driving, I found out the story. 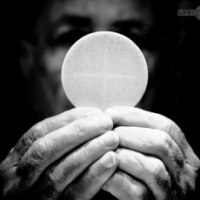 It turns out that at a parish about an hour away, the main pastor of the church was telling the first communion children and others that the Eucharist was just a symbol and Jesus wasn't really present. One day the associate pastor was taking communion to an elderly woman at a nursing home. He placed the consecrated host on her lip but she was not able to consume it. The priest did what he was taught to do in a situation like that and he wrapped it up in a napkin. When he got back to the parish, he placed it in water for it to dissolve. Normally the host would have dissolved in a couple of days but in this case, it did not dissolve. Instead it turned into a round ball that looked like flesh. The pastor told him that he should throw it out. Amazingly not long before this happened an old tabernacle was being thrown out and the associate pastor felt he needed to keep it so he had put it in his living quarters. This old tabernacle provided a place for him to put the cup of water with what appeared to be Jesus' flesh. So, naturally my jaw dropped as I was being told this story. My roommate's friend who was driving us also shared that he had a sense that we would be "smuggling" the miracle back to campus. The reasonable person I was, tried to talk some sense into my friends. I warned them that we needed to test this and we shouldn't automatically buy into it. I was a little skeptical to say the least. After about an hour in the car, we finally arrived at the church. The associate pastor greeted us outside. He thanked us for coming and then he led us into his living quarters. He began telling us the whole story and then told us he did not know what he was going to do because the pastor wanted him to throw it out. He asked us if we would like to see it. Of course we said, "Yes!" He brought it out of the tabernacle very reverently and immediately, we all dropped to our knees. The presence of the Lord in that room was so strong and we couldn't help but praise him and sing. As we were praying, a couple of us that had our eyes open, witnessed this "ball of flesh" turn red and begin to pulsate. When we were done praying, it went back to being a grayish white color with frayed edges. He then put it back in the tabernacle and proceeded to talk to us. He again said he didn't know what he was going to do and that is when we offered to take it back to the monastery on campus. I couldn't believe what I was hearing. My heart was pounding so hard. I was so nervous! That is exactly what we ended up doing however and we held it in the car as we drove an hour back to campus. The whole way back was surreal and the presence of the Lord was so powerful. We were singing and praying the whole way back. Again as we were praying, it was turning red and seemed to be pulsating. There were also lots of prophetic words coming to us. One had to do with the scripture passage from 1 Timothy 4:12 - "Do not let anyone look down on you because you are young..." We had a sense that we might not be received real well when we got back to campus. When we got back to campus it was already dark. We knocked on the monastery door and one of the friars answered. We told him what we had and he asked, "What would you be doing with it?!" We then asked for another friar who personally knew the associate pastor of the church we came from. He then came out, heard our story and seemed to believe. He then told us he would keep it safe and contact his superior to see what should be done. We felt relieved that it was out of our hands. The whole next week was surreal. Everywhere we went it seemed people would randomly talk about the Eucharist. One example was when I was having a conversation with a girl about hand lotion and then she randomly said she always checks her hands after receiving communion because every little piece is fully Jesus. It seemed the Lord was confirming to us that this really was a miracle. After a week went by, I approached the president of the university. I asked him what was going on with the miracle. He told me it had started to dissolve and the priest we had met with at the monastery was asked to consume it. Once I heard this, I had a peace come over me. I felt for some reason the Lord just had the few of us witness this. That experience definitely gave me a deeper understanding and devotion to the true presence of Jesus in the Eucharist. It is only within the last couple years however that I have really begun to understand the infinite level of intimacy and love offered to us by receiving his body and blood. The real miracle is that at every mass the bread becomes Jesus' body and blood and we get to receive him into our bodies and souls. The real challenge when we receive him, however, is to allow him to enter all the inner chambers of our heart.